Pregame festivities, giveaways, and on-field activities ranging from check presentations to ceremonial first pitches by retiring ’Canes Norm Parsons and Ed Gillis are just a few of the many highlights planned for University of Miami employees, their family members, and their friends at UM Family Night with the Miami Marlins. And here’s one more highlight that’s pure luck of the draw: José Fernández, the National League’s 2013 Rookie of the Year who clinched the Marlins’ Opening Day win, is scheduled to take the mound. Taking place on Saturday, April 5, at the 37,000-seat Marlins Park in Little Havana, UM Family Night with the Miami Marlins is the University’s way of showing its appreciation for the dedication and outstanding work of its employees. The Marlins will take on the National League Western Division San Diego Padres at 7:10 p.m., but special pregame festivities for UM employees begin at 5 p.m., so be sure to arrive early. If you already have tickets, remember to bring them along with your food vouchers and your University of Miami ID (’Cane Card). And just as important, don’t forget to wear Hurricane orange and green. 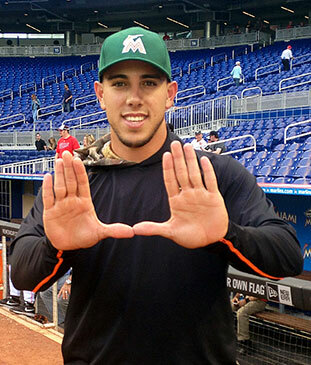 Marlins ace José Fernández throws up the 'U' in anticipation of pitching on UM Family Night with the Marlins. UM employees who don’t have tickets or need extras can purchase additional tickets for just $9 each on game day at the Marlins Park Box Office, located at the West Plaza. You must show your 'Cane Card or your existing UM tickets/food vouchers to purchase additional tickets at the special $9 rate. Pregame family activities and entertainment will be located on the West Plaza from 5 to 7 p.m. Employees must present their ’Cane Card or game tickets/food vouchers to gain access to the ’Cane Zone. On-field pregame ceremonies will highlight UM, including ceremonial first pitches by Parsons, executive director of the Wellness Centers on the Gables and Miller School campuses, who is retiring after 43 years of service, and Gillis, dean of enrollment management, who is retiring after 22 years. Law professor Richard Williamson, who has served as chair of the Faculty Senate for five years, is also slated to throw a pitch. April 5 also has been designated a “Saturday Spectacular” and will include free postgame festivities with DJ Laz on the East Plaza. Fans who wish to park in on-site garages are urged to pre-purchase parking at marlins.com/parking, which also provides detailed information on public transportation to Marlins Park, on-site and off-site parking, and alternative ways to get to the ballpark. Marlins Park is located less than two miles from downtown Miami, only three-quarters of a mile from the westbound SR 836 exit at 12th Avenue, and 0.4 miles from the eastbound exit at 17th Avenue. Via Interstate 95, the site is 1.25 miles from the NW 8th Street exit. For directions to the park, click here. For specific details on the ballpark, visit the Marlins A to Z Guide at www.marlins.com/ballparkguide. For handy take-along information, download the Guest Information Sheet. Marlins Park is home to the UHealth Physical Therapy Clinic, which, when the Marlins aren’t playing, is open to patients by appointment. UHealth Sports Medicine is the official sports medicine provider for the Miami Marlins and the Miami Hurricanes.